The decision appears to mark a climb-down from the firm line previously adopted by prosecutors, although the arrested environmentalists and journalists could still potentially face several years in prison. The decision appears to mark a climb-down from the firm line previously adopted by prosecutors, although the Greenpeace group could still potentially face several years in prison. Hooliganism in Russia carries a maximum penalty of seven years in jail. 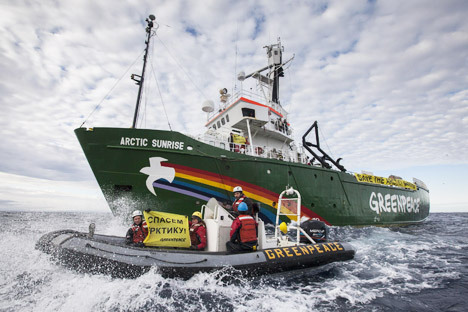 Russian authorities seized Greenpeace’s Arctic Sunrise icebreaker in mid-September after activists tried to scale an oil rig in the Arctic in protest against offshore drilling in the area. All 30 people on board – comprising 28 Greenpeace activists and two freelance journalists – were detained and later charged with piracy, which is punishable by up to 15 years in prison. Greenpeace said in a statement that it was unsatisfied with the downgrade. Greenpeace rejected suggestions that its activists had put anybody at risk. Russia has come under mounting international pressure over the case. Eleven Nobel Peace Prize laureates last week petitioned President Vladimir Putin to ask him to aid in releasing the group. “We are writing to ask you to do all you can to ensure that the excessive charges of piracy against the 28 Greenpeace activists, freelance photographer and freelance videographer are dropped,” said the letter, which was co-signed by South African archbishop Desmond Tutu and Iranian lawyer Shirin Ebadi. Putin weighed in on the Greenpeace issue a few days after the group was detained by criticizing the activists’ actions, but argued that what they had done was not piracy. “Our law enforcement authorities and border guards didn’t know who might be trying to seize the rig under the guise of Greenpeace activists,” he said in remarks televised by the state-run Rossiya-24 television.